Ranch, hummus, dill dip, and green goddess are my favourite home-made dips, which can also be enjoyed as sauces and dressings over veggies and protein. 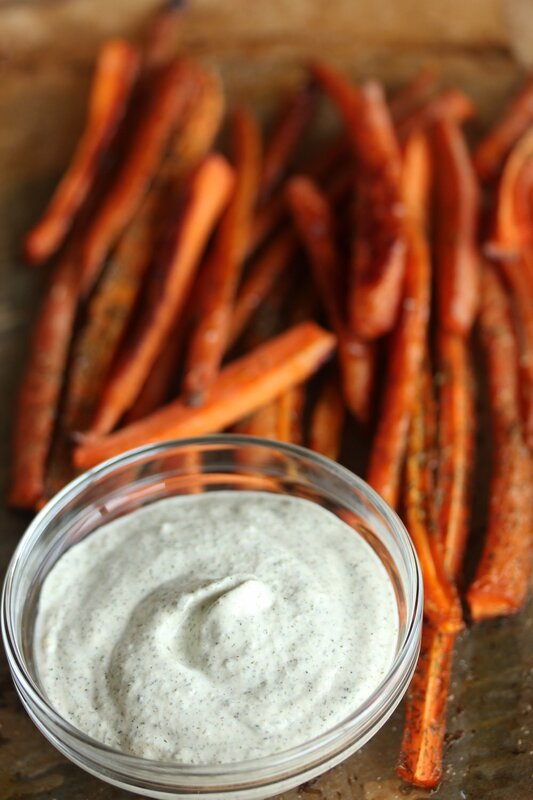 Ranch and hummus are my go-to's to serve with raw veggies as a snack or with lunch. Raw vegetables are easier to digest during warm seasons since the yang (warm, bright) influence of sun energy stokes our digestive fire. Conversely, if you tune into your body on rainy, dark days you may feel more prone to bloating and indigestion from foods that aren't cooked and warm. This is because there is less yang (bright) energy on cool, dark, damp (yin) days to assist in the yang energy of transforming and transporting food into nutrients. These examples portray atmospheric awareness. Holistically, we can see that our physiology and mental emotional health are inseparable to our environment as we live and adapt with the changing seasons. Vegetables are an ideal snack as the water and fiber content helps to promote satiation while the vitamins, minerals, and antioxidants nourish the body. I like to keep a large container of prepped veggies in the fridge. And let’s agree that vegetables are so much more enjoyable with a dip. If you look at the label of dips and dressings in grocery stores you can see that they’re often filled with preservatives and unnecessary ingredients. A simplified whole foods version is just as, if not more, delicious and economical. As a bonus the high fat content assists in the absorption of antioxidants in the veggies. Aim to try a new vegetable every week -- my personal favourites for dipping are: carrot, cucumber, raw cabbage, radish, jicama, kohlrabi, and raw beet. I also recommend trying the dips as dressings over protein. Enjoy! 1. Soak the dried beans with 3 cups water in a large bowl overnight. Drain and rinse. Place in a medium sized saucepan and add 3 cups water. Bring to a boil, reduce heat to medium low, and simmer for 1 ½ - 2 hours. Drain and rinse. *If you have an instant pot, pressure-cook the beans and water for 20 minutes and wait for the mixture to naturally release. Alternatively, skip using dried beans and use a small BPA-free can of chickpeas or lima beans. 2. Transfer the cooked beans to a food processor with the remaining ingredients and process until smooth and creamy. Refrigerate to set for a few hours. 3. Serve with olive oil and paprika. Store in an airtight container for up to a week. 1. Add the hemp hearts, water, cider vinegar, lemon juice, garlic, onion, and sea salt into a high-speed blender and blend until smooth. 2. Add the remaining ingredients and blend on low to mix. 3. Transfer to a container and refrigerate for approximately 1 – 2 hours to set. Keep refrigerated for up to 10 days. Add the coconut yogurt, lemon juice, apple cider vinegar, raw honey, and dijon to a small mixing bowl and whisk to combine. Sprinkle in the remaining ingredients and stir well. Store in an airtight glass container for up to two weeks. * Refrigerate for a couple of hours before serving to allow the flavour to develop. * For a caeser dressing add an additional ¼ teaspoon Dijon mustard, 2 teaspoons caper juice, and 1 teaspoon of capers. 1. Add ingredients to a blender and blend on high speed until smooth and creamy. 3. Transfer to an airtight glass container and keep refrigerated for up to a week.